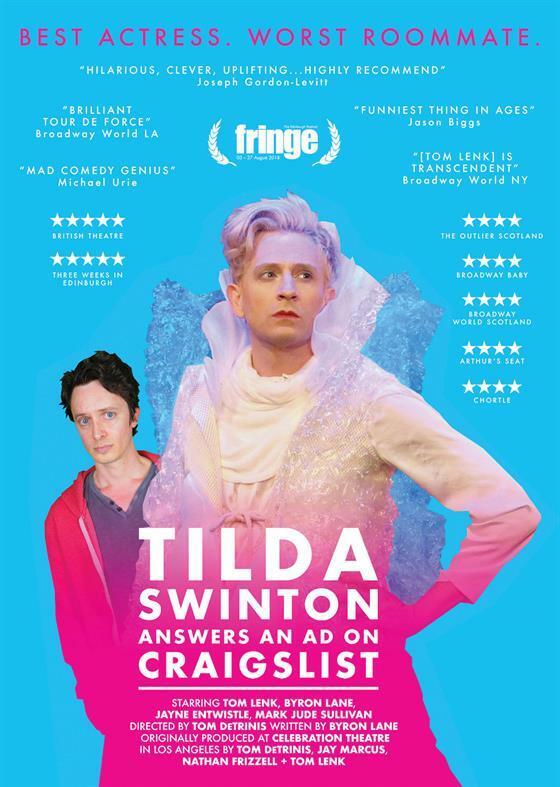 A big hit with critics and audiences, and following sold out runs in Los Angeles, New York, and Edinburgh Fringe, "Tilda Swinton Answers an Ad on Craigslist" is ready to make its eagerly-awaited San Francisco premiere. "Tilda Swinton Answers an Ad on Craigslist" stars "Buffy the Vampire Slayer" and Instagram celebrity Tom Lenk as Tilda Swinton, a modern day Mary Poppins who finds a depressed gay man on Craigslist and insists on studying and dissecting his life to research her next big movie role.British Theatre hails: "5-Stars... Clear why it has become such a cult hit… Hilarious, unforgettable performance by Tom Lenk… Quirky comedy tour de force that keeps the audience in fits of laughter.”Three Weeks Edinburgh says: "5-Stars... A gem of a show that’s downright hysterical, this must be seen to be believed.”And actor Joseph Gordon-Levitt tweeted: "Hilarious, clever, uplifting... highly recommend. "Other critics say: "Mad comedy genius.” -Michael Urie ("Ugly Betty")"